● HVAC Penetrations and Pipes: Oftentimes, HVAC systems rest on curbs that can be easily be sealed, however, corner seams can sometimes come loose. A cavity filled with tar or other poured sealing substance make the areas where the wires and hoses penetrate the roof watertight. These sealants shrink over time, allowing water to run into the building along the wires and hoses. Plumbing pipes often have boots with neoprene gaskets that wear out faster than the rest of the roof. ● Broken Field Seams: If your roof was properly installed, the field seams should have held for the roof’s intended lifespan, however, weather damage, excessive foot traffic, or possible disruption in the installation process could have weakened the roof and seams. ● Cracks in Tar: Built-up roofs (BURs) can dry and shrink as the years wear on. Fine cracks can develop in the tar and grow larger until they eventually channel water into the building. ● Cuts in the Membrane: Something as small as a boot with a pebble stuck in the tread can puncture a thinner, more economical roof membrane. Tools dropped by repair technicians can do the same. That's why A Plus Roofing Co. repair crews take extra precautions to prevent such damage. Stucco parapet walls can develop cracks and allow leaks that aren’t from the roof itself. The sealant in skylight assemblies can also dry out and separate from the curbs or panels. While any water coming in from above seems to be a "roof" leak, sometimes the leak isn't from the roof at all. That’s why it’s incredibly important to have a professional accurately trace leaks. If you’ve noticed leaks in your roof and/or walls, and aren’t sure of the source, A Plus Roofing Co. will come to your and conduct a full inspection. Our professionals will use infrared technology to detect hidden moisture. 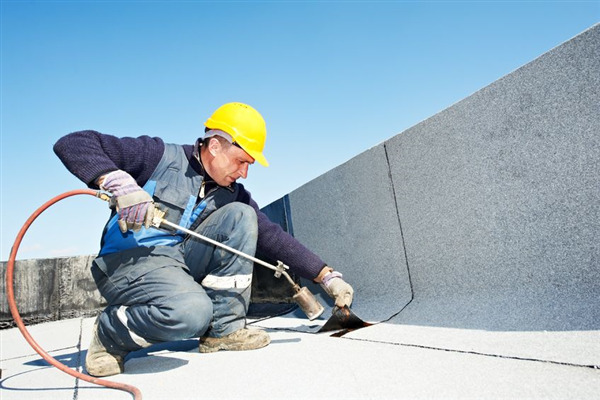 Whether you have an active leak or simply need to know the true condition of your flat commercial roof, contact A Plus Roofing Co. at 952-894-5435. We're located in Burnsville, Minnesota, and serve the Minneapolis/St. Paul Metro Area (Twin Cities). Schedule your inspection or leak repair estimate today.